Conduits of Love, Inc. is a 501(c)(3) tax exempt organization, and your donation is tax deductible. Donations will be applied towards providing birth and adoptive parents program services. No portion of your donation will be applied toward overhead expenses of the organization, unless otherwise specified by the donor. You can donate to us through PayPal using you credit card, debit card or PayPal account. To claim a donation as a deduction please keep your email donation receipt from PayPal for your records. 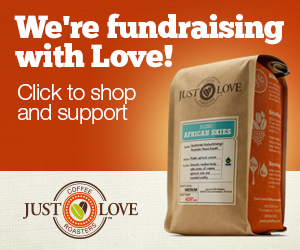 We are also fundraising through Just Love Coffee Roasters. You can purchase some splendid coffee and support us at the same time. Up to 36% of the proceeds of your purchase will be donated to Conduits of Love, Inc. Our fundraising efforts through Just Love Coffee Roasters are geared towards providing matching grants to families who wish to adopt but are facing financial hurdles. Please click the banner ad below to be directed to the Conduits of Love, Inc. profile page with Just Love Coffee Roasters.